Why do we care about Barcelona anyway? 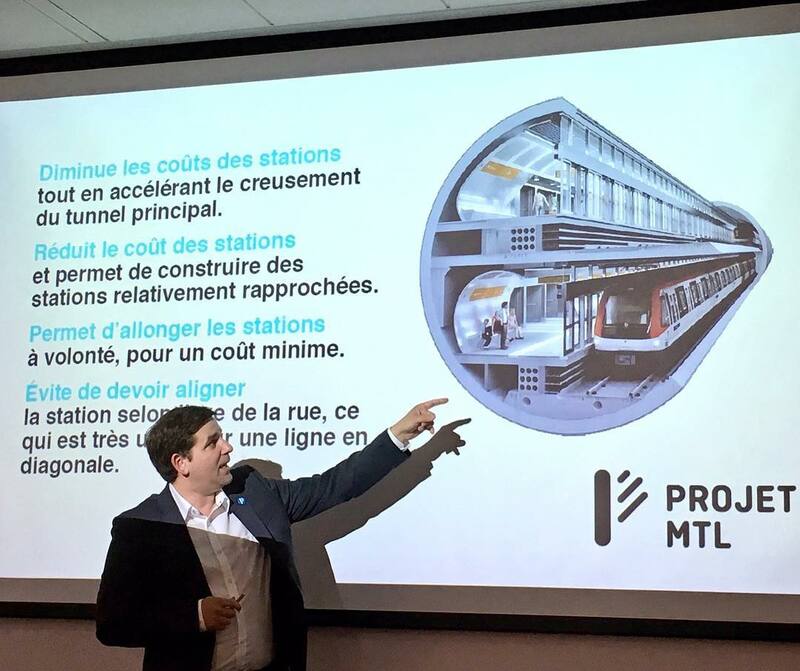 During the current electoral campaign in Montreal, Valérie Plante (Projet Montréal) proposed to build a new metro line, the Pink line, which would run diagonally from Montréal-Nord to downtown. The Pink line is actually inspired by Barcelona’s Line 9, both in terms of construction method and in some of the way it is planned to maximize its usefulness by connecting to neighborhoods, and not following the street grid by running deep underground. 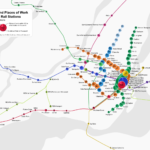 Projet Montréal estimates the Pink line to cost $6 billion, a number that cynical Montrealers were quick to dismiss. Incumbent Mayor Coderre first claimed it would cost $10 billion, now he’s trying to convince us it will be more like $25 billion. The scare tactic seems to resonate with budget-weary Quebecers who have seen their fair share of cost overruns on infrastructure projects. After all, the Orange line extension ended up costing more than projected, right? However, if we actually look at the numbers, we realize that $6 billion means $200 million per kilometre overall. Or, considering that a quarter of the line would be overground, about 250$ million per km for the underground sections. Compare that to the Orange Line extension, which ended up costing $143M/km and which was, puts it in response to the mayors outrageous cost claims: “We’re proposing a metro line, not a space program”. 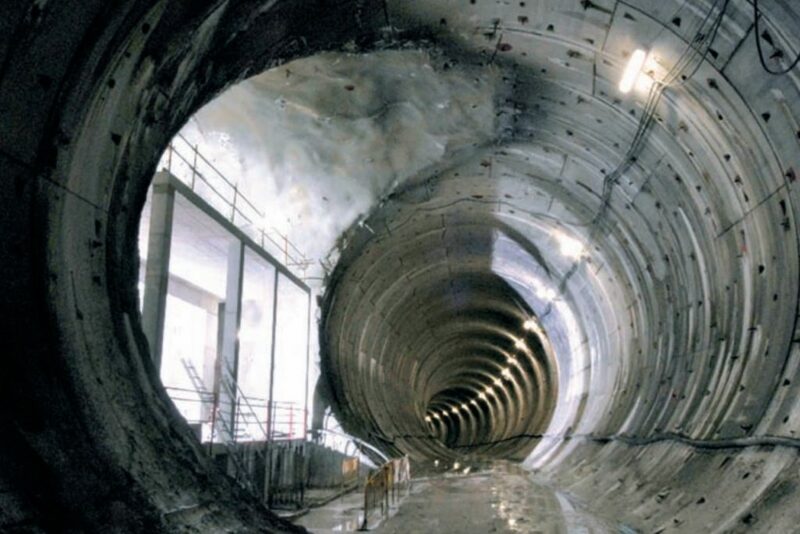 The tunnels are built using a giant tunnel boring machine (TBM). A TBM is a kind of tunnel-building factory. It will dig a tunnel and install it’s supprting walls at a rate of about 100 meters per week (page 9). 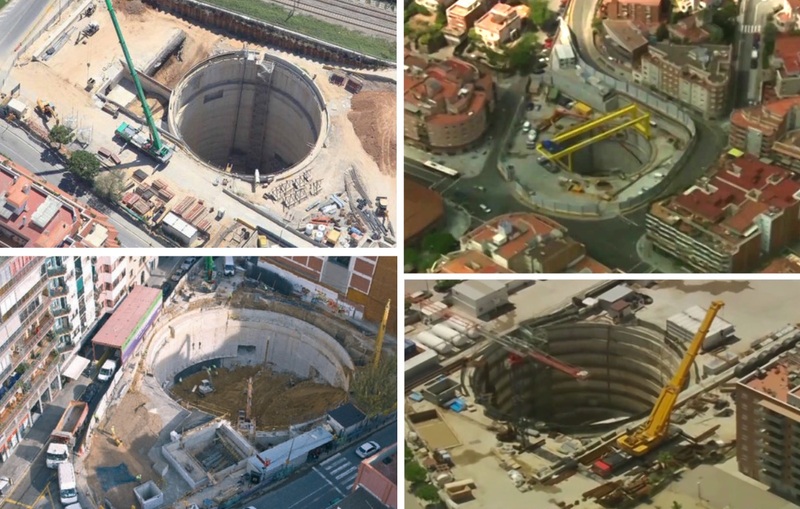 Over the years, the TBM technology has improved a lot. Even at this size, machines are standard and surprisingly affordable. At the stations, round pits, 25m in diameter connect the surface to the tunnel below. 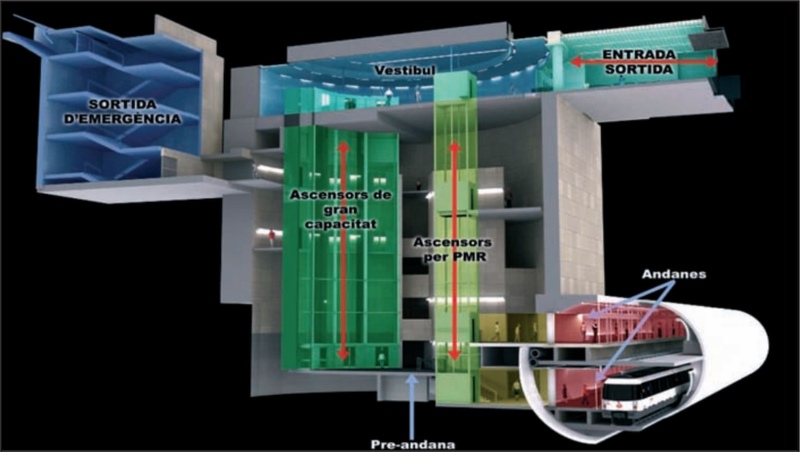 This station access column includes several elevators, which provide access to an intermediate level between the two metro platforms. There’s also an elevator that provides level wheelchair access to both underground platforms, and a set of emergency stairs. This means that at ground level, the impact of building stations is small – basically only the round 25m pits – so they can be built at locations that will maximize the nearby population or connections to other lines. 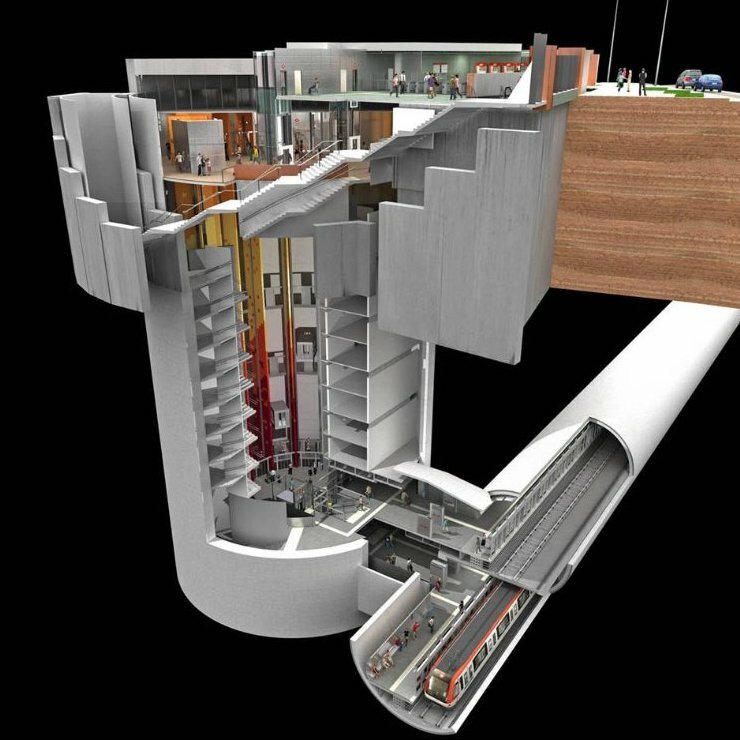 As for the tunnels, they run pretty deep, below all other infrastructure, which means they can go basically anywhere without disturbing existing structures and easily reach the stations, wherever they are built. This technology allows for a lot of flexibility in the location of stations, so city planners can focus on serving the population along the line, providing adequate transfers and optimizing the line to relieve the traffic on other, congested, metro lines. The Barcelona Line 9 project actually consists of two lines, Line 9 and Line 10, with a shared downtown section. This type of design allows more population to be served on the outskirts, while providing more frequency on the shared trunk section (which, being downtown, is also more expensive to build, so it makes sense to share the tracks). Of course, the frequency of service is lower on the outer branches, but having automated lines means there will be a train every 2 minutes (!) on the downtown section, and every 4 minutes on the branches. Without branching, i.e. merging multiple outlying lines into a single one downtown, it would be necessary to build multiple, nearly parallel downtown lines, if all the outlying lines are to have a direct connection downtown. Each of those would require less carrying capacity compared to a single line combining the branches. But overall, it’s much cheaper to increase the capacity on a line (i.e. by using 90m trains instead of 45m trains), compared to building multiple downtown sections. 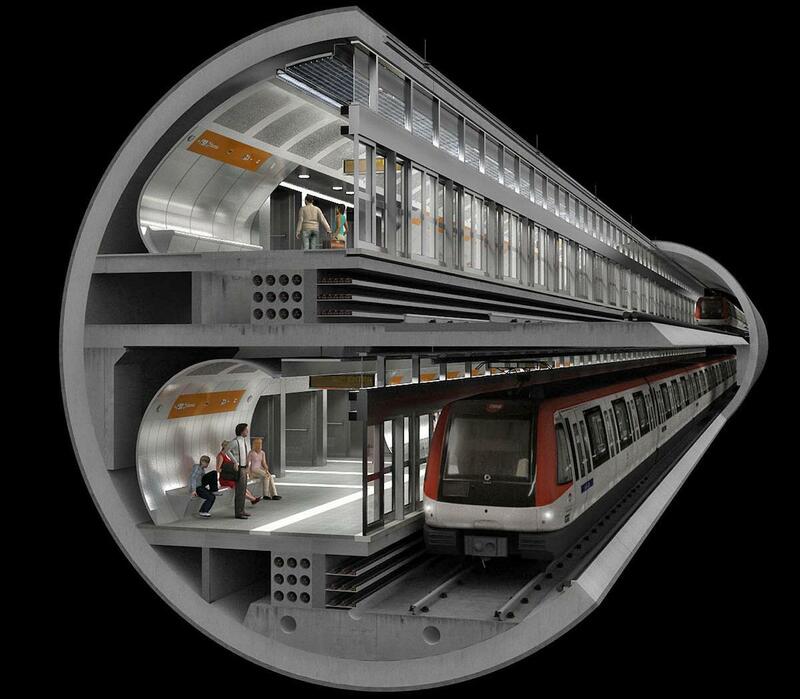 The Barcelona Line 9 doesn’t use the 12m diameter stacked tunnel along its whole route. Some sections are built using different construction methods, presumably because they are cheaper. This mostly depends on the local geography and available space. We can see that while the dense inner city segments use the large diameter tunnel, some outside areas use a smaller tunnel with two side platforms, excavated from above. There are also some short mined sections and sections built using cut-and-cover. Lastly, on a suburban branch, about 4km of the line were built above-ground on a viaduct. When constructing such a large infrastructure project, you have to consider it within the larger transit network. It appears that the Barcelona Line 9 is not just planned as an isolated line, but as a component of the overall network, with 20 of the 32 stations having transfers to other lines. One interesting aspect is the integration with the area around the large Segrera station, a new, large, mostly underground station complex where metro lines, regional trains and long distance trains meet. Around this area, the L9/L10 is running parallel with an extension of the L4. The central section of L9/L10, currently under construction, with several transfer stations. Note the short extension of L4 (bottom right) to complete the network around the La Sagrera station project. 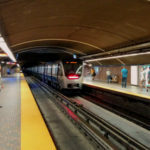 At the Sagrera station, the L9/L10 lines have a cross-platform transfer situation (similar to Lionel-Groulx in Montreal). This allows fast transfers, while reducing cost (compared to building two separate stations), by sharing infrastructure and being built at the same time. One thing I find interesting is the metro line’s approach to safety. Nowadays, many subway lines are constructed using two tunnels, one for every direction. Using frequent cross-passages, one tunnel can act as the emergency exit for the other one. 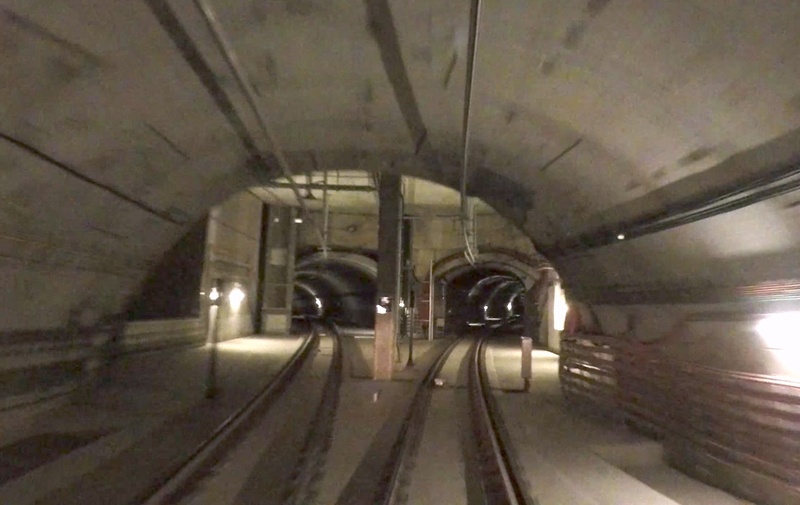 By having two levels separated by a ceiling, the two levels of the Barcelona Line 9 actually act as two separate tunnels for emergency purposes – despite being initially dug as a single tunnel. So you get the advantage of the cost reduction of using a single tunnel, together with the safety advantage of two separate tunnels. This also means that frequent emergency exits to the surface are not necessary, as required when using a single undivided tunnel. Tunnel section with a track ramp connecting the two levels/two directions. Notice the lack of emergency walkways next to the track. One interesting thing to notice is that there isn’t much space for walkways inside the tunnels. In the image above, there’s no place to walk between the center wall and the train. It appears that the tracks themselves must be used as the evacuation passage. It’s helpful to build the tracks on concrete slabs without any ties – providing a mostly smooth surface to walk on. Also note the use of an overhead power to provide electricity. This is unusual for a metro, especially one which is so space-constrained: metros generally use a third rail on the ground to provide power to the trains, and overhead wires are used for more spacious main line tracks. By using an overhead rail instead of overhead wires, the power supply is much more compact. Using the overhead power has the advantage that there are no open high voltage power lines on the ground. During any evacuation situation, there’s no worry anybody will accidentally step somewhere they shouldn’t and get electrocuted. 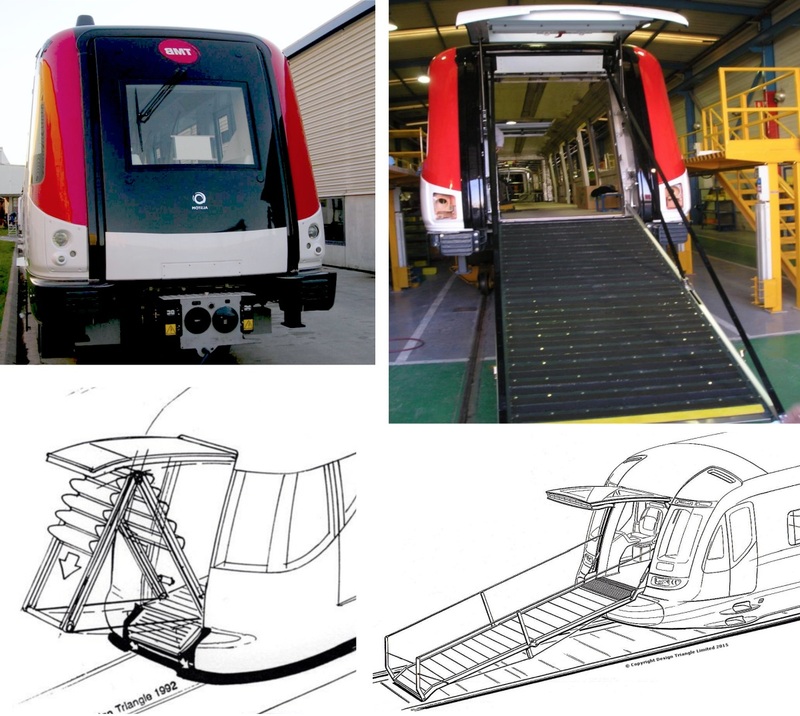 An interesting innovation is the use of long ramps in the front and back of the metro trains (pdf) that can be used in emergencies, even by wheelchairs. 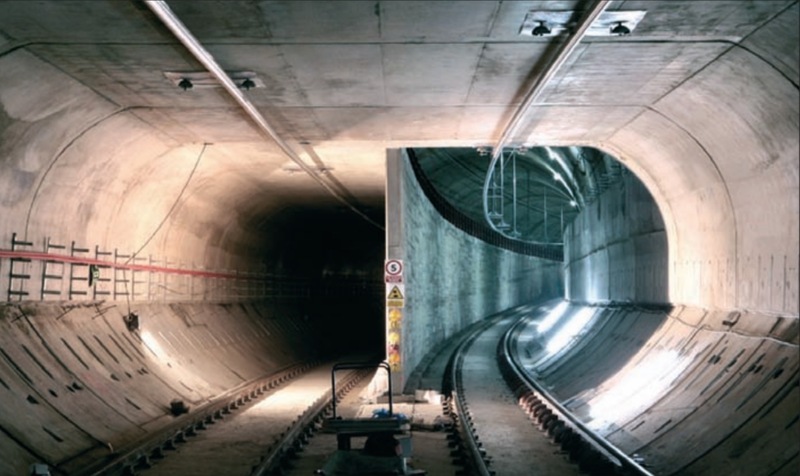 It allows passengers to evacuate via the front and back, so tunnels can have a very small profile and still be safe. It’s interesting to have this integrated safety concept. It combines the single large diameter tunnel, overhead wires, smooth track areas and ramps on trains into a single package. Having stations so deep underground is a great way to avoid having to deal with all the infrastructure already in place in a city, but it also means you have to go pretty far down to reach the metro. Even with fast elevators, this can take time. Preferably, stations should be built as close to the surface as possible, to minimize the time it takes to get to the train. Relatedly, by only providing a single access, the area that lies within walking distance is smaller, compared to having two access points, one at each end of the station. Again, if stations are less deep, accesses are cheaper to build, and it will possible to build two of them. Any line should always attempt to stay as close to the surface as possible (for Montreal’s Pink Line, these great depths don’t seem to be necessary, so we should be in good shape). Another issue of the Barcelona Line 9, is actually cost. The Initial estimates for the Barcelona Line 9 pegged the cost at around 2 billion Euros (3 billion CAD), but actual construction cost turned out to be 6.927 billion Euros (10.3 billion CAD). Per kilometre, that’s 145 million Euros (216 million CAD). But we have to consider that this project is hugely complex (much more than the Pink line), with great tunnel depths, station insertions in the middle of neighborhoods, 20 transfer stations, complicated geology. So overall, the cost is still very reasonable . Overall, Barcelona’s Line 9 is a very interesting project that should definitely be used for inspiration, not just for the technological aspects (large diameter TBM with stacked tracks, use of different construction methods including viaducts), but also the planning aspects (maximizing population access, network thinking, branching). 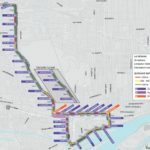 Using some of the same techniques, good spending discipline and some cost optimizations, it should indeed be possible to construct the “Pink Line” proposed by Project Montreal with cost projections that are at least similar to the estimated $6 billion. Also check out this video introducing the line. Thank you for a very excellent and interesting overview of Barcelona’s new Metro system. Overall, I am impressed with the design & engineering. I have just one question, which seems difficult to answer given the images provided: Is it true, as I understand it, that there is only one elevator to provide disabled/pushcart access to the platforms from the mezzanine level? If so, is there also a ramp that is provided? For a metro system which is running such high-capacity trains at such high frequency (eg., every 2 minutes on the Barcelona trunk line), providing only one elevator for such access would seem to me a major constraint on capacity. I suppose it is possible that the number of wheelchair users in Spain is much less than in the U.S.A., where I live, perhaps because of the better overall health of your population. Regardless, provision of a simple wheelchair ramp would seem preferable to a single elevator, which could be inconvenient, slow, and unreliable. Awesome writeup! Feeling hopeful for the future of this line. I didn’t test the assertion. But I believe they may be counting underground sections. I think you may be counting track km for the underground portion of the Central line, not line km. You have a great blog with a global perspective. In your REM critique you point out the lack of peak capacity coverage, but don’t bring up altered behaviour. Work hours are becoming more flexible, so you might see a flattening of the peak in your graph. Also, an all day system will promote multi-hub/ urban centre development and so-called reverse commuters which would make better use of trains in both directions. The economic affects of this would be complicated to work out. I would be very interested in a comparison of the Pink and REM lines. I’d say the Pink reinforces the centre-periphery commuting patters and some redundancy. The REM provides regular service to low-density urban fringe areas which could in fact reinforce urban sprawl, counter to the overall objectives. I’d be inclined to go with the multi-hub/ urban centre growth model reinforced by the REM. REM + Pink and orange and blue expansion seems too rich, particularly when there are other areas of the country that are way more auto-oriented and need the transit funding more (particularly medium sized cities).